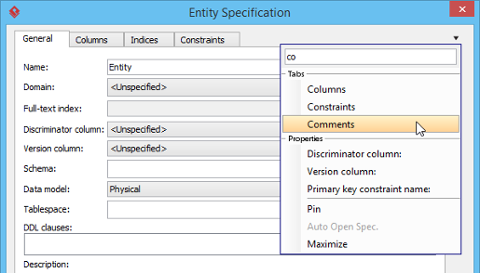 The properties of model elements can be edited via the specification window. In the window, properties are categorized into tabs. To reduce complexity, only the popular tabs are presented by default. You can optionally turn the hidden tabs on. You will learn more about the specification window in this article. Right click on the target model element which you want to view or edit its details and select Open Specification... from the pop-up menu, or select the model element/shape and press Enter. 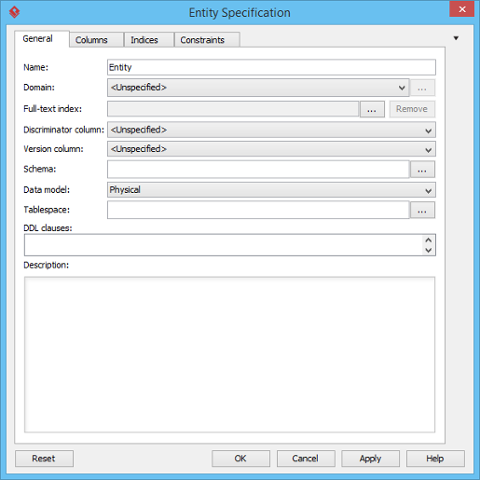 As a result, the model element specification window pops out. The open specification window provides you with access to all the properties of a model element, but to reduce complexity, only the popular tabs are presented by default. If you find a property not available in all the opening tabs, try to look for it by performing the steps below. Click on the tiny inverted triangle at the top right of the specification window. Type the property name in the search box and select the property matched. An additional tab will be shown. You can then view and edit the property under that tab. By enabling pin and auto open, you don't have to close the current window in order to browse another model element specification. Select Pin from the drop-down menu. Select Auto Open Spec. from the drop-down menu. Now, you can select another model element to view its specification, without closing the specification window. Select Maximize from the drop-down menu. You can choose the same menu again to reduce it to the default size.